At Home with Gracey: Slice, Slice, Slice! After spending several weeks looking for a decent kitchen slicer and at a decent price that would slice things "paper thin" ... I finally found one. Well, I found a few, but not many were available locally in stores, and those that were cost a whole lot more than I was willing to pay in order to "try" a recipe out. 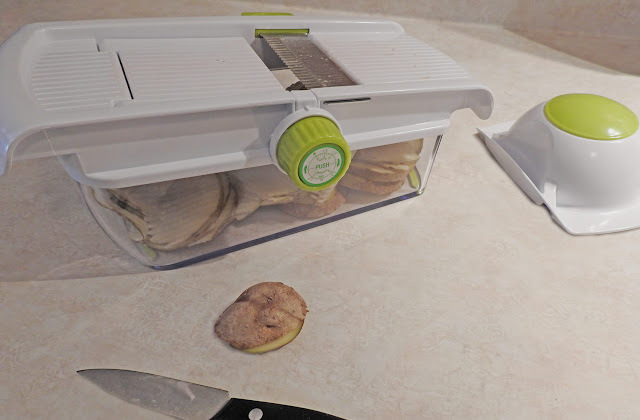 One site online had some that cost over $200 (some over $300) ... yeah, to slice taters. Initially, I was looking for an old slicer that my mom had given me after I got married. She used it for years in her kitchen, until my dad got her a big old fully-chromed electric meat slicer. She used that meat slicer for just about everything ... veggies, fruit, bread ... and meat of course, but anything she wanted to slice thin, she used the electric one. The Dial-o-Matic ended up in my kitchen until I got a food processor. The food processor (big, expensive, and a pain in the rear to clean all the time) got it's fair share of use before I finally got rid of it. As my family grew, I stopped "canning" things, and had no need of the bulk or cleaning chores (back then, the food processor parts couldn't go in the dishwasher). But by then, I had already gotten rid of the the Dial-o-Matic as well. Today, when cooking for two, a knife usually handles most slicing in the kitchen, but I needed to slice some potatoes super thin and as even as I could, and the one thing I'm not great at is slicing things evenly (doesn't matter if it's bread, meat, or veggies they're always thick at one end, and thin at the other). Anyway, I did find a couple of choices at Walmart, but also more than I wanted to spend. I could have ordered several online, but most were more expensive than Walmart. Local stores carried high-end chef slicers, and a huge host of dicers, choppers, and "one-thickness" slicers, but not one I could choose the slice thickness on. Eventually I found one in a new kitchen shop in the next town over (Kitchen Stuff Plus). It was pretty similar to the one Walmart had, but simpler. The blades are part of it, so you don't have a pile of parts and pieces to worry about, and you choose from a few slice thicknesses, down to a slice so thin you could almost see through it. Since it's a mandolin style slicer, it's meant for harder types of veggies (I've done potatoes, sweet potatoes, and cucumbers so far) and although it's already "on sale" (or was at the time we went to get it), it was reduced even further that day, and we paid $12.99 for it. Overall, I'm reasonably happy with it. It does what I wanted it to do, simply without fuss, and the clean up isn't much to deal with. Except for the blades, the parts are plastic, so I don't know how durable it is, but for it's intended use, I'd think I'll have it until I'm not able to cook any longer. That makes it "good'nuff" for me. I'd probably buy it again if I lost it.